Every year lakhs of people throng destinations like Ladakh, Spiti, Tawang and many other places in Himachal Pradesh & Uttarakhand and are often met with snowed in roads throughout the Himalayas. Icy conditions can make driving a real challenge for motorists, leading to dangerous incidents all throughout the year. Therefore, it’s important for you to prepare for such a journey with driving tips for all weather driving. No matter how experienced a driver you think you are, the mountains always have the upper hand! Our Himalayan Roadtrip this year, took us through heavy snowfall, icy roads, torrential downpour and treacherous patches all over Himachal and J&K. As a result, at times we weren’t experienced enough to handle these situations. Luckily we had prepared for such a situation, read a lot of driving tips and packed accordingly! 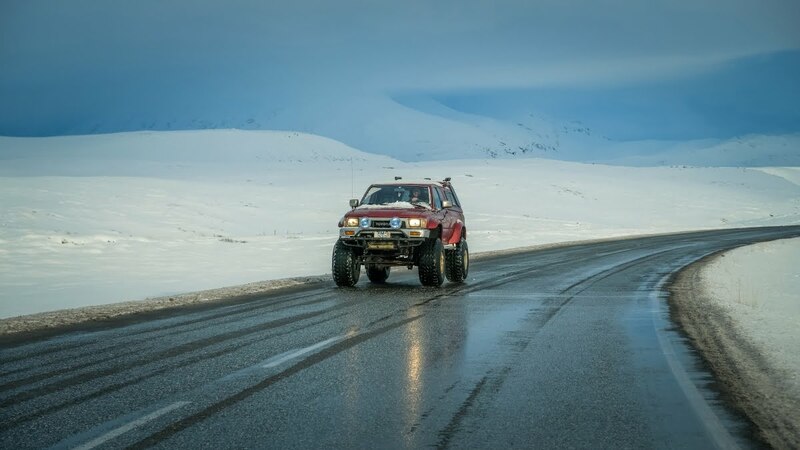 Here are some tried and tested driving tips for staying safe on the road in winter conditions and hilly terrain. These are better alternatives to the tires that most cars are fitted. They offer more grip in adverse weather conditions or bad roads. Off-road tires significantly improve your car’s performance resulting in better grip, more efficient braking and increased vehicle control. Snow chains must only be used when you drive through snow and should be removed once you get clear tarmac. However, chains or nylon ropes should not be fitted if there is not enough clearance between the wheel arch and tire. Because of the reduced gap, you can damage your car and render it useless. For cars that are equipped with electronic sensors in their tires, poorly fitted chains can also interfere with them and cause reduced braking. While driving uphill on an incline, always go down gears to get more power. Switch off the AC if required and if you are on bumper to bumper traffic, use the handbrake to keep from rolling back. If you are approaching an uphill hairpin bend, do not cross over to the other lane. Instead stick to your lane and you will make the bend just fine. A lot of us do this unintentionally and this is one of the most dangerous mistakes we can make while traveling through the mountains. Most hilly roads are narrower than highways and some drivers have a tendency to hog the center lane. While this may be ok on a straight empty highway, it is not advisable in mountain terrains with bends. You won’t have enough time to get back in your lane in case another vehicle from the opposite direction comes speeding towards you. Driving through mountains, hairpin bends or during bad weather is extremely tiring. You need to give it your complete concentration and it takes a toll on your body as well. You must take frequent breaks and drink plenty of fluids to stay hydrated. Fuel bunks are hard to come by frequently in mountain ranges so fill up at every chance you get! The weather conditions can change any minute and you don’t want to get stranded due to an empty tank! While planning your route, identify the locations of fuel stops and fill up whenever you reach one! Brake early when you approach turns as this is very helpful for your vehicle’s stability. If you brake too hard after you have entered the turn, the momentum shifts forward. As a result, it becomes difficult to gain control of your vehicle. But if you accelerate through the turn, the momentum shifts towards the rear of your vehicle, giving you much more control. Brake before the turn and accelerate through. Use the pulse braking method – a technique where you brake in short, quick intervals instead of jamming the brakes too hard. Using this method can help to keep your brake pads cool, functional and reduces the risk of skidding. Whenever you drive through hilly terrain or during bad weather, ALWAYS keep your headlights on. If the weather turns bad, use your emergency lights as well. Lights increase your chance of getting sighted and helps avoid accidents. The same goes for honking and you should give short honks at every curve to inform the vehicles in front of your presence. This is where most accidents occur, especially in hilly roads in India. Before overtaking, check signs for bends, watch the vehicle in front before overtaking for any signs of change in speed, and NEVER overtake on curves. It is a good habit to notify the vehicle in front that you intend to overtake either by a flick of the headlight and a short honk so that they are prepared as well to let you go ahead! A common mistake that many of us do while driving downhill is to drive in Neutral, thinking it will help us save fuel. NEVER ever do this. A car moving downhill in neutral can lead to brake failures as people coast down at high speeds and use their brakes aggressively to negotiate turns. Driving in neutral also disables engine braking which is very important while driving downhill or in reducing speed. Black ice is a thin coating of ice on the road, usually transparent and almost invisible to an amateur mountain driver. If the road looks polished or glossy it could be “black ice” – one of winter’s worst hazards. Black ice is difficult to see. It is nearly transparent ice that often looks like a harmless puddle or is overlooked entirely. You need to watch out for black ice, especially in sheltered and shaded areas on roads, under trees and adjacent to high walls. We hope you found these driving tips helpful and if you have anything to add, do leave your suggestions in the comments. If you are a biker, then we have handy riding tips for you here! How To Travel With Pets?